Since the launch of BlackBerry 10 almost two years ago, there has been only slow changes among the population of BlackBerry users that continue to use the classic BlackBerry operating system. Still some progress has been made in getting users working towards (slightly) newer OS versions. 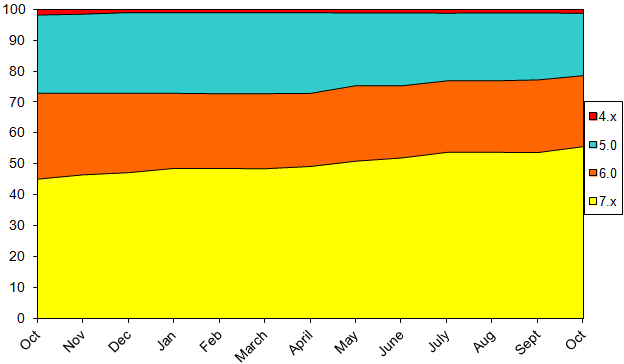 The month of October saw 55.7% of users running OS 7 and 78.7% of users on OS 6 or higher. This data was collected by BlackBerry World for downloads of the free BlackBerry strategy game Pixelated. Data shown on the chart is from the beginning of October 2013 through the end of October 2014, and does not include BlackBerry 10 or PlayBook devices.